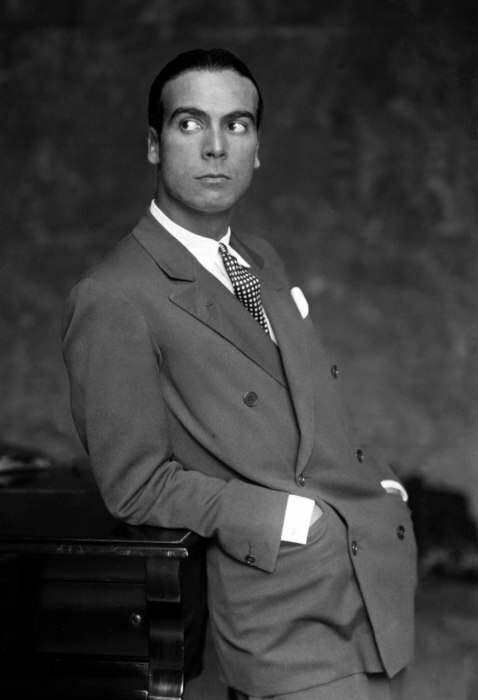 Cristobal Balenciaga photographed by Boris Lipnitzki, circa 1927. If Cristobal Balenciaga were still alive today, he would have turned the formidable age of 119. His house, which had its first Paris fashion show in August 1937 and thrives today under the tutelage of American designer, Alexander Wang, is seventy-six years old. Seventy-six years. In three quarters of a century, fashion has been shaken by revolutions, quakes, resurgences, it’s seen the future, and even faced waves of conformity. Yet Balenciaga’s designs have withstood the test of time and especially, the fickleness of fashion. Balenciaga was a precocious child and due to his mother’s work as a seamstress, developed an early interest in dressmaking and fashion. As the myth goes, Balenciaga had become enchanted by the supremely elegant Marquesa de Casa Torres, whose beautifully tailored English suits left him in awe. Eventually he summed up the courage to approach the Marquesa and offered to make her a copy of her suit. Torres, being the most distinguished woman in Guetaria, a small fishing village in the Basque region of Spain and Balenciaga’s birthplace, naturally would have been hard to impress. However, impress he did, and the Marquesa became one of Balenciaga’s earliest patrons whose introduction to Paris couturier, Jacques Doucet, set in motion Balenciaga’s inevitable course to becoming the king of Paris fashion. 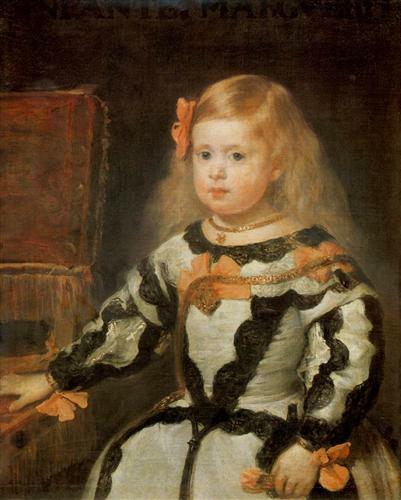 Portrait of the Infanta Maria Marguerita, Diego Velazquez, 1654. 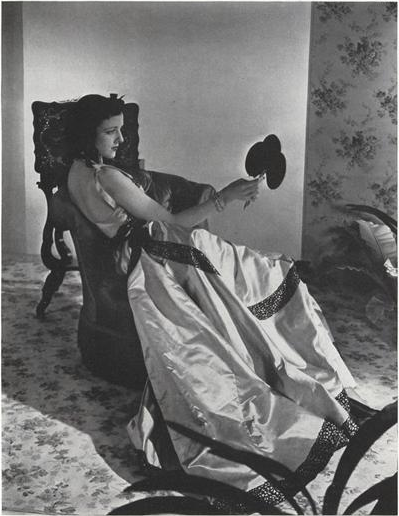 Miss Mona Maris shot by Horst P. Horst wearing a “Velazquez” inspired gown in Vogue, September 15, 1939, 72. A Spaniard through and through, Balenciaga’s earliest collections were heavily influenced by Spanish history and culture. According to Diana Vreeland, “[Balenciaga’s] inspiration came from the bullrings, the flamenco dancers, the fishermen in their boots and loose blouses, the glories of the church and the cool of the cloisters and monasteries.” These references, oftentimes literal and sometimes abstract, remained a consistent theme that manifested themselves throughout his various collections. A double balloon costume shot by Irving Penn for Vogue, September 1, 1950, 129. As one of the few couturiers who knew how to cut, fit and drape his muslin patterns, none of Balenciaga’s designs was purely superficial, but always reflected his firm understanding of construction and a fabric’s inherent qualities. He preferred working with stiff fabrics such as silk gazar (an innovation created in collaboration with Swiss fabric house, Abraham) working them into sculptural forms. The interior of his dresses reflected his sense of austerity. In contrast Dior’s gowns were heavily padded and relied on complex construction to create a nipped waist and perky bosom. Balenciaga’s designs, on the other hand, embraced women of all shapes and sizes, and his clothes skimmed rather than hugged a woman’s curves. This meant comfort and full range of movement. 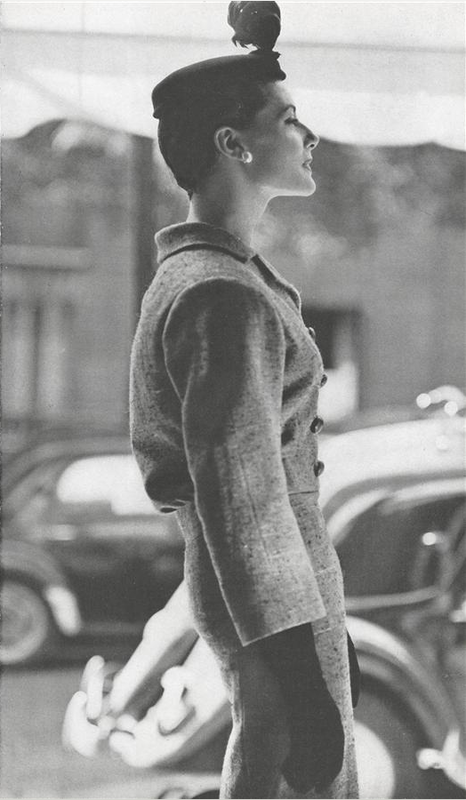 Rounded shoulders and bracelet length sleeves of a tweed skirt suit by Balenciaga. Vogue, October 1, 1963, 152. Balenciaga’s designs were some of the earliest to introduce space between the body and the garment even when Dior’s figure hugging silhouette were at the height of fashion in 1951 (although that being said, it’s untrue that Dior’s Bar silhouette had absolutely no effect on Balenciaga’s day suits- see below.) His day suits, too, always kept the woman wearing it in mind. “Bracelet” sleeves were introduced to allow a woman to show off her jewelry, volume was added in surprising places and collars rolled outwards to emphasize the collar bone. Wedding dress and evening dress by Balenciaga. David Bailey, Vogue, July 1, 1967, 80-81. By 1963, Vogue acknowledged that Balenciaga’s “informed cutting, the superb cutting inside and out” had “began a way of life.” While his silhouettes never changed drastically, but evolved slowly, by the mid-1960s, Balenciaga’s designs became increasingly abstract. 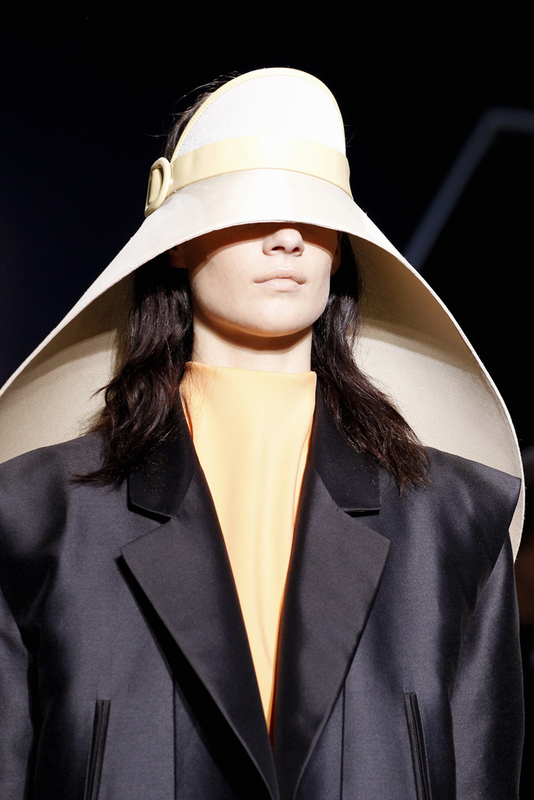 Women were transformed into geometric shapes and lush fabrics ensconced the body. 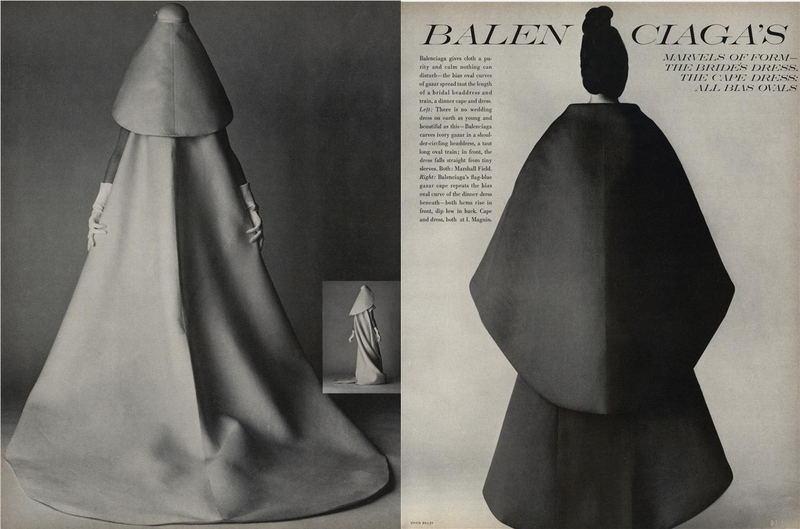 Despite his age and years in business, WWD reported that in 1966, Balenciaga, “Still Wears Paris Crown.” Some of his most famous silhouettes introduced during this time were the sack dress, the baby doll dress, and the chemise. Vogue, September 15, 1967, 86-87. Vogue, September 15, 1967, 88-89. Nicolas Ghesquière for Balenciaga, Spring/Summer 2012. Photograph courtesy of Style.com. Nicolas Ghesquière for Balenciaga advertisement featuring actress Jennifer Connelly, Spring 2008. Unlike other designers who have slowly fallen into obscurity, Balenciaga’s designs have long outlived their master, who passed away in Spain on March 24, 1972. They are a testament to his genius and remain utterly relevant today. Nicolas Ghesquière, who was at the helm of Balenciaga from 1997-2012, admitted that access to the house’s archives in 2002, “changed my approach completely.” Ghesquière, upon seeing the archives, realized that concepts such as abstraction that 90s modernism centered around, originated with Balenciaga. “His work is still so modern,” explains Ghesquière, who reenvisioned Balenciaga’s geometric veil from 1967 twice, for Spring/Summer 2008 and 2012. Fashion historians across the board including Dr. Valerie Steele have touted him as the “greatest fashion designer of the twentieth century,” a title that has also been doled upon Christian Dior (who coincidentally shares the same birthday), yet even Dior himself described Balenciaga as “The master of us all.” Chanel, the great modernist, considered Balenciaga alone a “couturier in the truest sense of the word” compared to everyone else who she relegated to being merely fashion designers. Why did his peers hold him in such high regard? 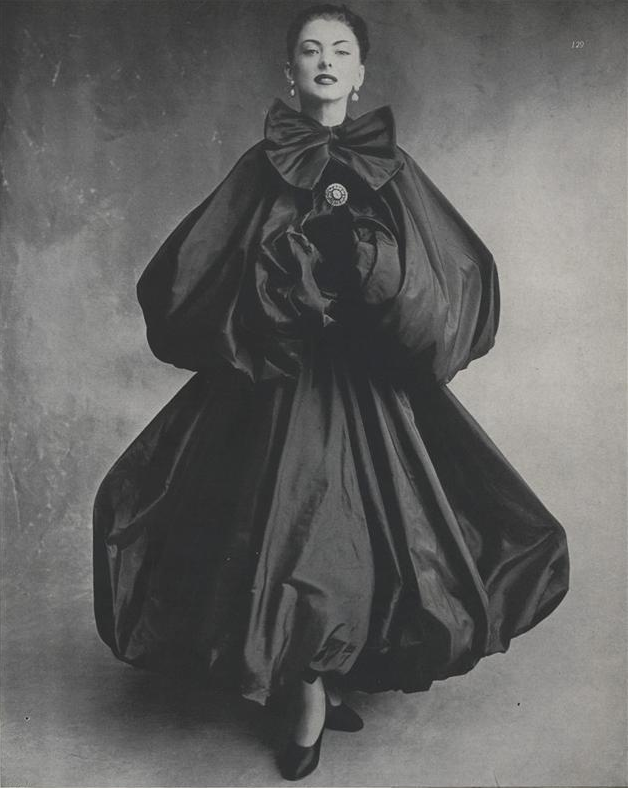 What was it about Cristobal Balenciaga that made him surpass all others? Unlike Dior whose “New Look” shook the fashion system in 1947, which essentially brought unrestrained luxury and feminine curves back into fashion, Balenciaga’s ideology was thoroughly modern, timeless and directional. Balenciaga never fully succumbed to the prevailing trends. His designs, backed by his expert knowledge of construction, were innovative and intellectual but always aware of the living, breathing, feeling woman underneath it, and therefore masked in simplicity. New York designer, Alexander Wang, who was chosen to succeed Ghesquière after his departure in 2012, has his work cut out for him. How will he uphold and respect Balenciaga’s tradition while carving out a space in history for himself? Only time will tell. 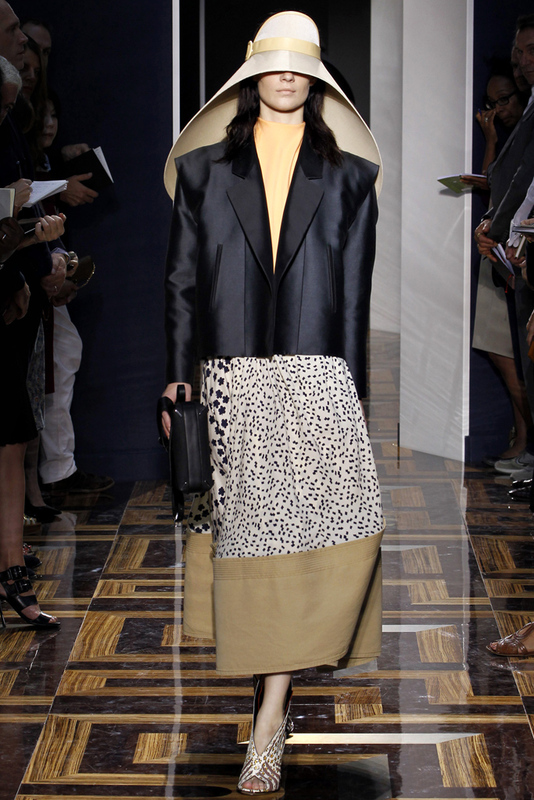 Evidence of Dior’s Bar silhouette’s influence on a Balenciaga day suit. 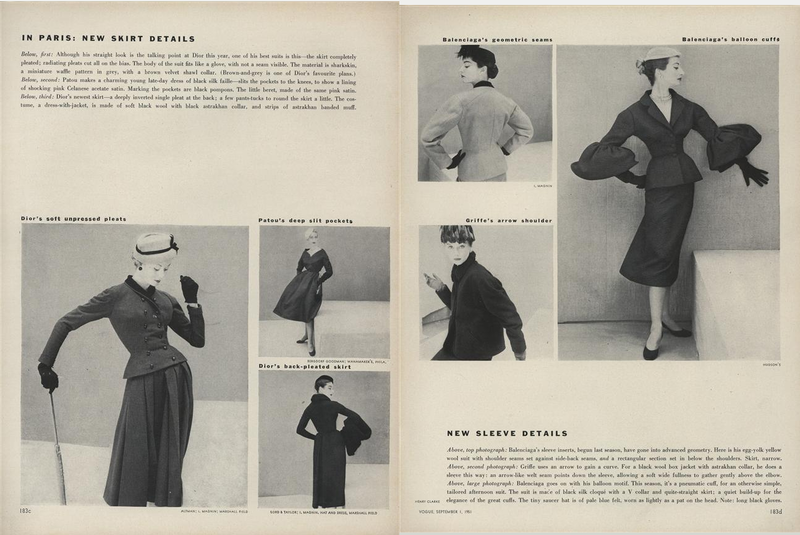 Vogue, September 1, 1951, 173c-183d. 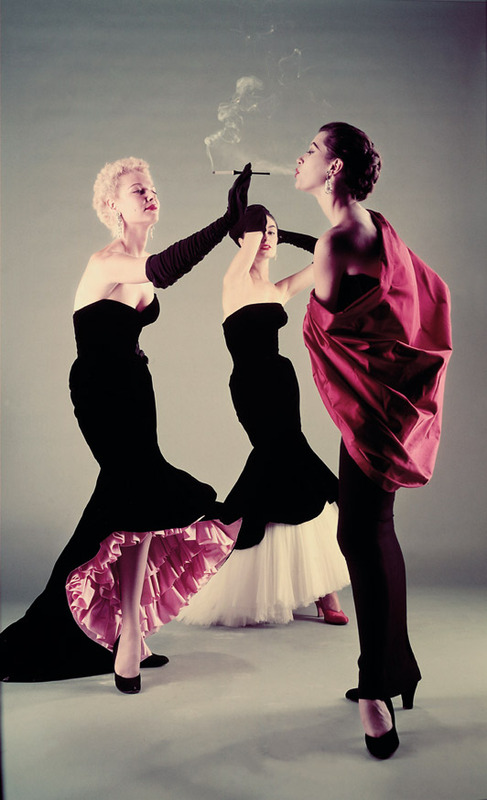 A black and pink ruffled flamenco-inspired evening dress by Balenciaga from 1951. 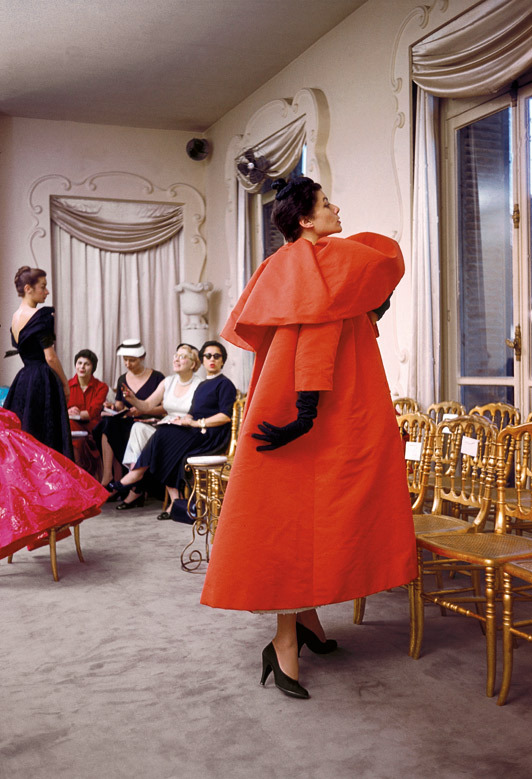 A voluminous evening coat by Balenciaga seen at an I Magnin fashion show in 1954. 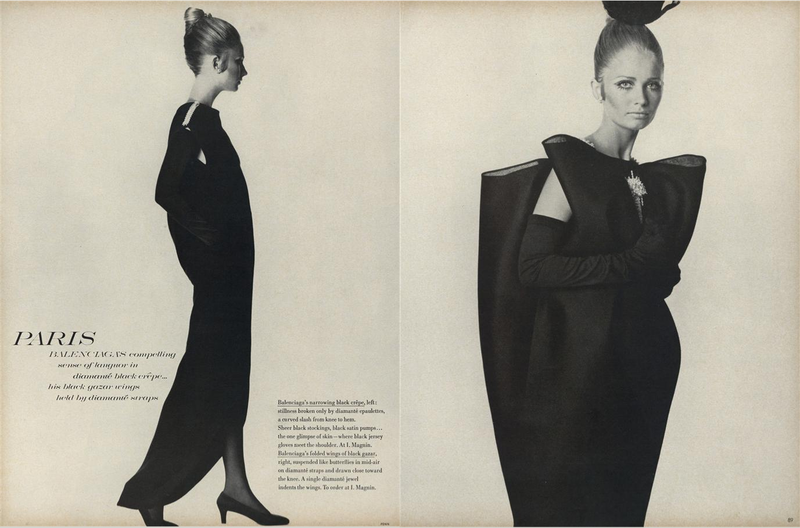 “Vogue’s Eye View of Balenciaga—the Drama, the Discipline,” Vogue, April 15, 1963, 53. WWD, August 4, 1966, cover. Hamish Bowles, “The Balenciaga Mystique,” Vogue, March 3, 2006, 512.